Also never seen that Pioneer central console before! very rare!. My uncle in his E21 has something similar but made with aluminum, i think the made it based on pictures of your console. uwbuurman wrote: No pioneers from the factory, but why not use them anyway? They are period correct. Any info of any stereo stuff was mounted at the factory or if it was only available as an option (not necessarily Pioneer) ? Well, first time this has happened to me, a broken spark plug! On Saturday 23:rd I was going to get some fuel, since I was down on the "R" on the gauge, but no low fuel warning light (not sure if it's working, bulb is okay though) and just after a short while it started to run rough as if one or two cylinders didn't fire, so I thought it was the fuel and decided to continue on to see if I indeed was out of fuel, but it kept running and a minute or two later it started to run normal again so I continued to the gas station. Then when I had filled her up and went to drive home, immediately after starting, it was running bad, definitely missing a cylinder, so I had to creep home at about 30-40Km/h for about 5-6Kilometers hoping that it would clear up, but this time it didn't. As you can see, a bit of the ceramics around the centre electrode is gone. No wonder it was running bad! Luckily the little ceramic bit didn't fall out as can be seen in picture nr. 2. It's stuck under one of the side electrodes. Running the same 4 electrode plugs in my old Benz, that has gone much longer (more than 30 000km, since last change), with no issues, so I don't know what caused this. Maybe fine crack from factory or dropped somewhere along the way to the auto parts store, who knows. 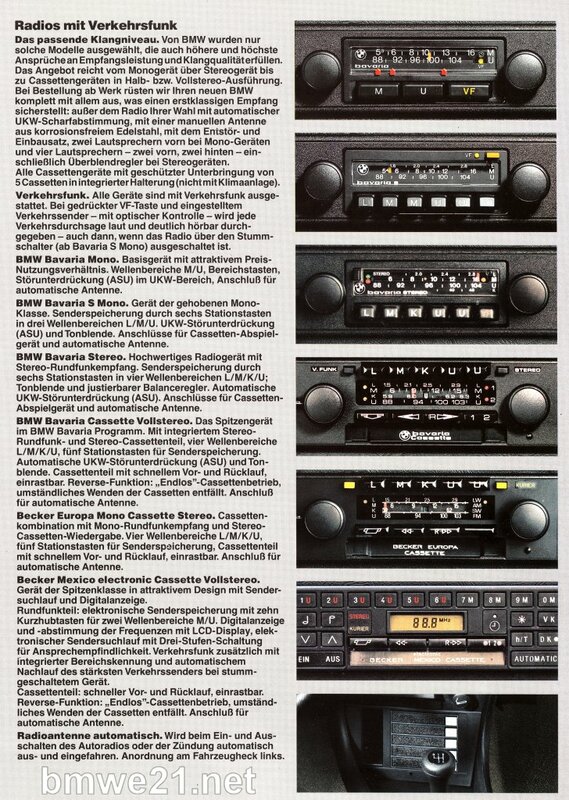 As for car stereo, the only things you could opt for from the factory, as far as I know, was a radio preparation kit (speakers, antenna and wiring) and a choice of BMW Bavaria and Becker radios like the pic below, taken from a 1981 factory brochure. That broken spark plug... wow! Not something you see every day indeed but yes, I agree that it is most likely to be a production issue or the spark plug was dropped at some point. They look like Bosch Super 4's, correct? As far as I've experienced myself these do work best in M20 engines, even used them in my E30 race car back in the day, and I've never had a Bosch spark plug fail. Yes, it was the Bosch Super 4's. Did think about going with them again, but the store didn't have them and they are quite expensive, so I went for the NGK BP5ES. I have thought about it but it has worked ok with the first fan I had and ok with the second fan in the old radiator and now also in the new radiator. The current mounting that I'm using, is made specifically for mounting a cooling fan to the radiator. I don't think there is a risk of them pulling them self through the radiator, at least not a new one, an old corroded one, then I guess there's a chance. Ah, there you say something, aluminium radiators are more sensitive of course. The fronts are TS-461 with Pioneer speaker grilles (no part number on that unfortunately). Googling TS-461 gives pretty much zero info, there are some TS-P461 and TS-H461 but those are much newer and not the same. Since the TS-461 is mentioned here: https://www.garaget.org/?car=4814 and this is a BMW sold in Sweden and it also has almost the same rear speakers as in mine. Also saw a BMW (I think it was an E28) in the scrap yard (close to where I live) some 10-15 years ago which had what looked to be TS-2080 in the rear. I don't know anything about that, but a great find!